When we first moved to Puerto Armuelles, a neighbor explained to me that he always keeps a $5, $10, and a $20 dollar bill on hand in his glove compartment. He keeps it there in case he is stopped for speeding on his trips between Puerto Armuelles and David. By this man’s reckoning, if he is really lucky, and the traffic cop who pulls him over is just looking for a free lunch, he might get away with paying as little as $5 to the patrolman. He prefers this to waiting for the cop to write out a ticket. 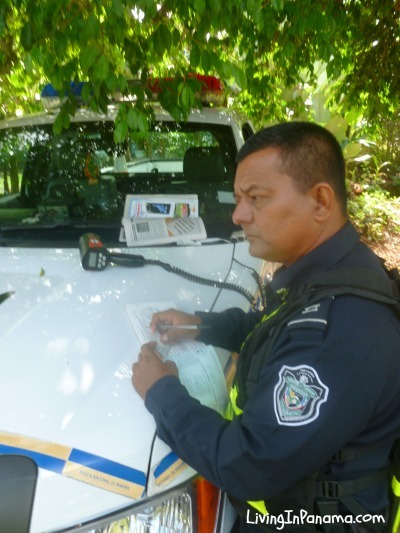 And getting a ticket means my neighbor will then have to drive to the Chiriqui Mall in David to pay the ticket, waiting in what could be a long line, and then shelling out the $58 fine. Paying this little “mordida” ( “Bribe” in English) to a cop might seem like a little thing. After all, the whole #@!^%#!! country is corrupt anyway, right? However, when we participate in corruption, at any level, we are not doing ourselves or others any favors. 1st of all, we are not being honest. It is interesting, but being honest really is a means, as well as an end. Paying your traffic ticket is its own gift. Life is simplified. You can relax and breathe easier. The whole world feels like a safer, saner place. Panama is definitely more beautiful, when don’t play the bribe game. There is lots of great advice out there, including learning ways not to be fooled as a “newbie”. However, if some seasoned expat explains to you that “you are in a corrupt society, and you need to protect yourself by playing the game yourself”, you should take a moment. Pause… Breathe. Ask yourself if you are interested in keeping the cycle of corruption going, merely to save a few bucks. In the long run, if you are a dishonest expat, you will wind up in far more trouble with the law, and with the society here, than if you are a dishonest Panamanian. Panama has massive corruption, but mostly at the political/legal level. You can see evidence of this every day in the newspapers here. For instance, ex-president Ricardo Martinelli trying to defend the vast corruption that permeated every fibre of his recent administration. Meanwhile, in one’s personal dealings with “regular” Panamanians, there appears not to be too much corruption. When you talk to your neighbor, he will tell you the truth, well at least as often as your neighbors “back home”. During the course of your normal and routine activities you will be untouched by corruption. Also beware a few fellow expats. It is not only corruption by politicos you have to look out for, but by expat businessmen. A few expats come to Panama to take advantage of its bureaucratic and judicial corruption. They use it as one of their business tools. Let me emphasis, this is not the case for most expat business people, only for a few. In many cases, these folks are pulling out of a failed investments “back home”, and transferring their remaining funds to Panama in hopes of recovering their lost assets. In our life, it had been these “corrupt” expat businessmen who purposely manipulate Panama’s already corrupt legal and administrative system that have caused us grief. Don’t pay bribes. To cops or others. If you are stopped by a policeman, just take the ticket. If you give the cop $10 so you can move on with your day, that cop is much more likely to stop more people in the hopes of scoring $10 or more from each one. Don’t try to manipulate the system. Of course, you have to acknowledge that others may, you should protect yourself from that. But by participating you are not helping yourself in the long run. Once you start paying bribes, people start to know you will pay a bribe. You are then a mark. There will be start to be all sorts of “problems” in your life that you are told can be solved with a little monetary lubrication. By moving to Panama, you find that you have much more free time. And also much more influence upon others. Historically, Panamanians have respected and trusted North Americans. Despite the brief, yet rough period of the “upheaval” years, and the burning of the American flag, as well as the coining of the expression “Gringo” to refer to north Americans soldiers, by extension, all US citizens. By and large, Panamanians admire North Americans. It is a little hard to handle just how much we are admired here. It’s a bit like being a movie star. They respect our supposedly higher level of culture, education, experiences, and yes, our income. It could be mostly our higher incomes. This is particularly true in our town of Puerto Armuelles; since for most of its history it was an American-created company town. Due to this intrinsic respect, Panamanians, particularly poor Panamanians, often look to us to lead, and to help them solve their problems. Rather than let our new status here go to our heads, and ruin us, we can do something useful with our influence. Panama is a tiny country, with a population of about 3 million. With the influence that the average expat here is capable of commanding, we can participate in shaping the future of this tiny, precious nation. This means participating with Panamanians on a positive, daily basis. Above all, this demands that we not participate in, and thus contribute to, corruption in this young democracy. In the end, it will help each of our lives down here in this “tropical paradise” be happier. Isn’t that one of the reasons we are here, to be happy? Very nice e-mail on not participating in corruption. Countries with a high level of corruption will never serve their populace and develop their economies as they should. The U.S. government has been cracking down on companies paying bribes overseas and issuing huge fines. We have to do what is right on a person level too. How does one go about to rent a small apartment for a few months in Panama? Corruption exists with the building codes that require concrete foundations in an area prone to earthquakes. They exist to benefit the contractor, while leaving the homeowner at risk for extreme damage when the concrete crumbles. I could build an earthquake resistant home but building codes would never permit it. The design is approved by the architectural departments over over 20 U.S. universities.